Flashcards and drills don’t feel like much fun to kids who are struggling to grasp academic facts. Tim Bedley, a veteran elementary school teacher, sought to combat this problem when he came up with the idea for his band Rockin’ the Standards, a talented trio who somehow manage to walk the line between being instructive and entertaining. Their surprisingly appealing math album contains tracks like “Parallel or Perpendicular?,” “The Place Value Rap,” and “The 6’s Song,” tunes designed to help students remember basic mathematical principles and skip counting (enormously helpful for multiplication) in a way that sticks. Both the song lyrics and album are available for download. In addition, Tim's own website contains helpful resources for teachers, including videos on teaching techniques for a variety of subjects. 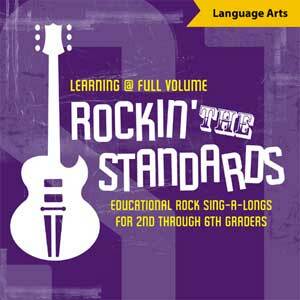 The band has also released a language arts CD, featuring songs like “Plural Y and F,” and “Parts of Speech.” Trust us, it sounds dorky, but parents and teachers should not be surprised to find themselves singing snatches of Rockin’ the Standards’ songs even when there are no kids in sight.